Sited on a slender lot fronting Port Susan Bay, this 2+ bedroom/2 bath tomato red cabin stands out amongst paler homes that line a charming Camano Island road. The original structure was a dark and drafty 322 sf. fishing cottage built in the 60s, and primarily used during summer weekends. Having discovered one of our homes nearby, the owner hired us to reimagine how the property could accommodate more visitors. 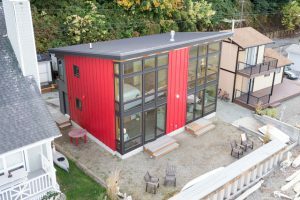 FabCab collaborated with a land-use consultant, and the owner was granted a shoreline variance, resulting in a roughly 700 sf allowable building footprint. We enthusiastically began designing a new home that would comply with these restrictions and delight the owner. To maximize usable area, we added a second story featuring a balcony overlooking the living space. A master bedroom and a bathroom are on the second floor, along with a sleeping loft. On the first floor, a flex space adds an additional sleeping area along with a second bathroom, washer and dryer, and kitchen/living area. The final design yielded an open and light-filled modern cabin for family and visitors to enjoy throughout the year. This is our second TimberCab home on Camano Island. To see additional photos, please visit our photos page.